This giveaway has ended but check out giveaways link up above to see if there are any current giveaways going on! I’m so excited for my very first giveaway to be a Gooseberry Patch cookbook! I have loved Gooseberry Patch for a long time and I think I have recipes in 12 or 13 of their cookbooks. They are a wonderful company! If you don’t have any of their cookbooks, you should. This is the cookbook I will be giving away thanks to the generosity of Gooseberry Patch. It’s a small book ~ about 6×6 ~ with 48 pages. So many wonderful recipes are included along with tips on wrapping, thanks yous, etc. 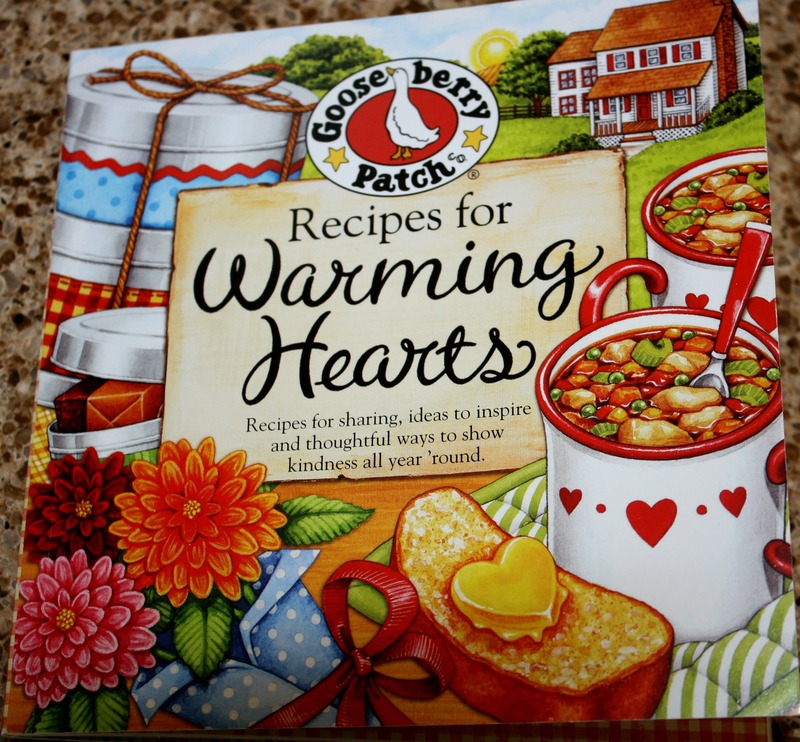 Here is some more about the book from the Gooseberry Patch site ~ Recipes for Warming Hearts. I made the chicken tetrazzini recipe and it was wonderful! I used a cooked chicken from the store and included the optional mushrooms. Super easy and both Mr. Meat Eater and myself said we would have it again. It’s a great recipe to included in this cookbook because it would be wonderful to bring to a friend or family member in need. Add a salad and bread and you have a great meal that’s easy on the pocketbook. Melt butter in a large saucepan or Dutch oven over medium heat. Add flour, salt and pepper; cook until bubbly. Add broth, sherry or chicken broth, chicken broth and milk or cream; bring to boil for one minute ~ making sure to whisk continuously. Stir in spaghetti, chicken, 1/4 cup Parmesan cheese and mushrooms, if using; mix well. Spread in a lightly greased 13×9 baking pan and sprinkle with remaining Parmesan cheese. I’ll be running this giveaway until midnight on September 28. I will put all entries in a bowl and have Mr. Meat Eater or a friend pick the winner. I will post the winner here and on my facebook page. The winner will have to contact me within 3 days with name and address and I will send out the book by priority mail. If I don’t hear from the winner within 3 days, I will pull a new winner. For one chance to win ~ please comment with your favorite dish to bring a friend or family member in need. For a second chance to win ~ like A Recipe A Day on Facebook (if you already do, just say that) A Recipe A Day. Comment here that you have. For a third chance to win ~ like Gooseberry Patch on Facebook (if you already do, just say that) Gooseberry Patch. Comment here that you have. All entries must be here NOT on my Facebook page. If you have any questions, drop me a line at a_recipe_a_day at yahoo dot com. I’ll be sharing another recipe from this book in the coming days! ← Will I Ever Find the “Right” Burger Recipe? Soup (made with ground beef), a nice lettuce salad, rolls and some brownies or cookies–YUM!! Gooseberry Cookbooks are the best gifts to give for newlyweds….gives them a helping hand on dinners!! I like both “Recipe A Day” and “Gooseberry Patch” on facebook. Just started receiving your recipe a day. I love recipes and I love Gooseberry Patch! I would like to be entered into the giveaway. I like both “Recipe A Day” and “Gooseberry Patch” on facebook. I have loved to cook for as long as I can remember. I actually love to read cook books. Excited about this giveaway. I love your blog! I usually base what I bring depending on the season. In the summer it is potato salad,waldorf coleslaw,settlers beans and a dessert like turtle brownies or rasberry pillow cookies.In the winter I like to do lasagna,stuffed shells,slow cooked roastbeef sandwiches,scalloped potatoes,cabbage rolls(golumpki) my grammy’s recipe and a dessert like apple ,cherry ,pecan,pumpkin pie or banana nut bread!! I so enjoy cooking and so does my little boy it gives us such a nice time for bonding!! I am a fan of Recipe a Day on Facebook!! I am a fan of Goosberry patch! I’m a Gooseberry Patch fan on Facebook. My favorite dish for a friend in need is homemade macaroni ‘n cheese. Great comfort food. What I like to bring a friend in need is comfort food. I will bring a stew, lasagna or even a roast with the trimmings. Of course, you must include a dessert like a cobbler. I like Gooseberry Patch! No, I love Gooseberry Patch! I liked you and gooseberry patch on fb! I love to bring people soup when they’re sick…chicken noodle or cheesy vegetable chowder. A dish I like to give to those in need is a nice, cheesy lasagne and/or homemade cinnamon rolls. Thank you for entering me in the giveaway! I am a gooseberry patch fan on facebook. I usually do a shepard’s pie casserole, with a salad. Hi. I have also “liked” A Recipe A Day on facebook. I am trying the Ravioli casserole from the Pasta Recipe book! I am excited about trying it! But am very concerned that it is to much cheese! The Raviolis are cheese and I am using as directed in the recipe to use the cottage cheese and mozzarella cheese as well as sprinkling Parm cheese on the top! I was thinking about adding browned ground beef in it also! Maybe next time getting the beef raviolis! What do you think???? Good evening! I already “like” you on Facebook. Please enter me for a second chance to win! Thanks. I love Gooseberry Patch and can’t live with out you!!! I do not know how to register for any of the give a ways! So please help me out with that! I made the Chicken Stroganoff, from your slow cooker book! It was awesome and now I am going online to send it to the rest of my family to try! I also make the Cheesy Garlic Biscuits with it! I put the Stroganoff over mashed potatoes and my husband was loving every minute of it! Thanks for your help in the kitchen! I hate making the same old same old thing over and over again. I am 53 years old and I am just now learning new things from you! Thanks again and please help me learn how to register for the give a ways! I want to win something for the first time ever!!! I make soup or something easy to heat up. If they are single, I put it in single serve dishes. If it’s a family, I put it in a large bowl. I make sure to send crackers, cornbread, etc, to compliment the meal. I also try to send some type of small dessert. I usually make lasagna or macaroni and cheese (homemade, of course!) and I also take a nice tossed salad with either of these, complete with dressing. Please enter me in your contest. I already like Gooseberry patch on FB. My favorite meal to give to a friend is Meat Lover’s Casserole. I enjoy sharing a casserole – called “company casserole” It is layered ground meat with tomato sauce – fine egg noodles and a mixture of cottage cheese, sour cream and cream cheese. I think a casserole is always nice they can heat it up as they r hungry. I also liked ur fb page and gooseberry patch fb page. I think a casserole is always nice they can heat it up as they r hungry. thanks for picking my name ……..love new easy recipes!!! I love the recipe a day on here!! If someone is sick and stuck in bed I always like to take them a nice container of my special homemade Potato Soup! It’s what warms the soul! MMMMM!!! To take a pan of gooey chocolate brownies made from scratch! I was lucky to stumble upon your page with this great opportunity to use/learn some of your recipes as well as winning a possible cook book. Thank you for sharing what you do. Gooseberry Patch is awesome on FB, in the Stores etc!! I love this site and your cookbooks!! My favorite dish to take to someone are my famous meatballs. I, too, have been published in Gooseberry Patch cookbooks. What an honor! I like to make people in need my Cincinnati chili!! 🙂 I just liked your page on facebook, and I already like Gooseberry Patch. Thanks! Favorite recipe to bring to a friend is chicken escarole soup with bow tie pasta. I like to make/give Cranberry Chicken. It makes a double batch. . .so I have one for my family. . .and one for my friend in need. I send a bag of Uncle Ben’s Ready Rice. . .and the chicken is made in the crockpot. . .so it is really easy. I already like gooseberry patch on facebook! Love the books! I also have liked both facebook pages. Long time ago. Love both pages and have used so many of the recipes. Love doing new recipes. Gooseberry patch on FB is awesome! I like Recipe A Day!!!! I like to take friends taco lasagna or banana crumb muffins! i like to bring friends chicken soup or dessert. who can resist a sweet treat, even if sick? i also belong to gooseberry patch on facebook. i always make a homemade chicken pot pie…it just warms the soul and fills the body with comfort…i have to admit i am not a great cook…trying to learn though..but this is one of the things i feel really confident making and its so tasty. What an awesome giveaway – thanks for the chance! A huge pot of Chicken Noodle Soup always stretches enough to feed a crowd and a lil chicken soup fixes everything …right lol!?!? Love good recipes, cooking lots, Gooseberry Patch and Giveaways! I like to make my lasagna. It’s the ultimate comfort food! I like Recipe A Day & Gooseberry Patch on FB. Very cool site. Thank you for the recipe. I like making chicken & dumplins for friends…they all want some when I make them! Oh, and I like GP on Facebook. Love them! Favorite to give in need or not: cookies! I love to bring chicken noodle soup…it is so warming! I like to bring friends in need my Chicken Spaghetti. Thanks for the GP giveaway !! I like to bring a quick pasta lasagna casserole – delicious, quick and easy to make! I like to bring macaroni and cheese. I like A Recipe a Day on Facebook! I like to take my family’s favorite chicken casserole to friends in need (shredded boiled chicken breasts, cream of chicken soup, rotel, crushed Doritos mixed together and topped with shredded cheese and baked) and it always gets rave reviews. I also like to take my favorite Butter Pecan Coconut cake! It depends on the season. I love to make soups to share in the fall. I already am a fan of Gooseberry Patch on facebook! I already like Gooseberry Patch on Facebook! As they are one of the best ever cookbooks (and other books) that we adore! We love to make and give a dish we call enchilada casserole. It’s a favorite among our friends. A baked pasta dish, bread and of course dessert – any dessert from Gooseberry Patch will do :0) !!!! I like to take scones when I go somewhere. I like to make homemade scones to take somewhere. Love Gooseberry Patch cookbooks. I am a FAN and like RECIPE A DAY on FB! And my favorite thing to someone is a bread of some kind. Being it blueberry muffins or banana bread. I also love your blog. 3) When a friend is in need, I bring baked mac and cheese with a salad and spiral glazed ham, and seven-layer bars. I put all three of my post on one, I think I was supposed to post them separtely. I like A Recipe A Day on facebook. I like to bring green chile chicken enchiladas. I like A Recipe A Day and Gooseberry Patch on Facebook. Me again, one more time! I already fave and like Gooseberry Patch on facebook, I have already been a fan for almost a year now. I love the warm, cosy, country down home feeling i get from Gooseberry Patch’s books, recipes, website, videos. I am Marie Pitts email: carpediem5790@yahoo.com Thank you again for sponsoring this giveaway! I like Gooseberry Patch on FB..dont have a gooseberry book yet would love to win 1.. I like Gooseberry Patch on FB..havent bought a bookyet but would love to win my 1st..
I’m a follower of Gooseberry Patch on Facebook, too! I like to take a comforting casserole such as Chicken and Rice, or Chicken Divan. I love Gooseberry Patch’s Facebook page. I can’t sign into my account without checking for anything new on their page. I’ll bring a lasagna over to a friend when they’re having a rough time. I love the easy to follow recipes in the cookbooks. I can’t wait to try the new ones. The chicken tetrazzini looks great. I’ll be trying it out tonight. I love to give my Wet Burritos to help out a family in need! My fav. dish to bring a loved one is my lasagna. I use my home canned tomato juice to make the sauce and it really makes it a special recipe. Gooseberry Patch is a facebook friend of mine also. And, I think I have the daily recipe also. I love to take spaghetti and meatballs with a big salad to my friends and family. Love GBP and would love to win this cookbook!!!! I like to make my chicken pie with cheese crescents to take to someone and to gatherings. I like Gooseberry Patch and A recipe a day on facebook. I would bring Spinach/Potato soup years ago to my mother in law as she was aging and she loved that dish. It was to be served cold. I like to bring friends in need a dinner that varies with the seasons, but I always include homemade cookies to help cheer them up. I have liked A Recipe A Day on Facebook. I like (love) Gooseberry Patch! I like to take spaghetti to a family in need. It’s easy for them to reheat and serve as needed and it’s something children will enjoy. This recipe sounds delicious. I am already a fan of Gooseberry Patch. Would love to have the cookbook as I collect them & am always wanting to try a new dish. I take freshly baked bread, or if I know folks like ’em, my Sweet Potato Souffle. I’ve been a ‘liker’ and member of Gooseberry Patch for a while, and thanks to them, I’m also a new ‘liker’ of you/your site also!! Thanks for the opportunity to win a special G.P. cookbook; they are all so wonderful! Since desserts seem to be my thing, I like to make German Chocolate Turtle Brownies. Super yummy and are always a hit! i like A RECIPE A DAY on FB! I am a friend on FB to Gooseberry and have their collections ! 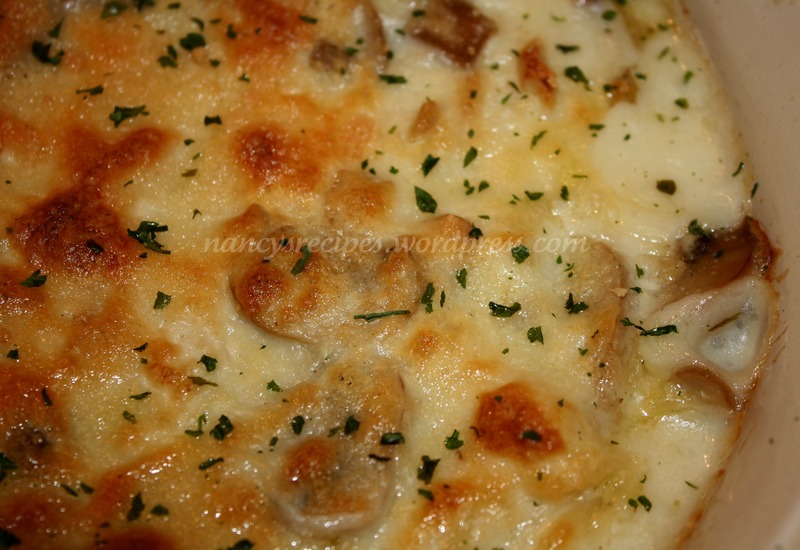 Love the chicken tetrazini recipe- pic look swonderful. A pasta dish with salad and bread/rolls. I already like Gooseberry Patch on FB. Glad I can add your site to FB. I am a fan of Gooseberry Patch on facebook. I have been collecting Gooseberry Patch books since their beginning. I love everything Gooseberry Patch! I usually take my Banana Nut Bread or Snickerdoodle Cupcakes. Sometimes a pot of Homemade Chicken Noodle Soup. I like to bring a basket filled with breads, homemade jam, tea and a small book, For the family I will usually make a batch of chilli and include hot dogs, cheese, onions, sour cream, and chips. I make Roman Holiday. I usually have everything on hand and even picky little eaters usually like it. Brown ground beef (or I use turkey), cook a box of pasta, sliced cheese and a couple of cans of stewed tomatoes. Layer them in a cassarole dish and bake. Really yummy! I also like to include chocolate chip cookies too. My favorite dish to bring is a pot roast, mashed potatoes & homemade parker house rolls. I already like Goosberry Patch on FB and A Recipe A Day on FB. My favorite food to take would be-chicken and dumplings. Now I ‘like’ recipe a day on Facebook! Wait, can I change that to ‘love’?! So many great recipes! Chicken retreading looks scrumptious! Meal would be dependent of the person and what they likes or dislikes were. I already like Gooseberry Patch on Facebook….Love their recipes!! I take strawberry cheesecake. I like A Recipe A Day & Gooseberry Patch. I like to take slow cooker Sweet & Sour Meatballs with a side of rice. I already liked Goose Berry’s page! I would take a dear friend some of my Chicken w/sage soup….delish! I already “like” Gooseberry Patch on Facebook. How could I love food and home and family and not “love” GP! There are so many choices when it comes to deciding on a dish to take to someone in need, I will vary what I make by the situation so it may range from chicken soup for someone who is ill to a roasted chicken and homemade loaf of bread to a family in need or mourning to a nice fruit salad and angel food cake for a new mother. liked “A Recipe A Day” today and was already friends with Gooseberry Patch on Facebook. I go to the library and check out the Gooseberry Books often. It would be nice to own one. I “like” Gooseberry already. BIG FAN! I like to bring homemade chicken noodle soup with frozen egg noodles to someone in need. Yummy and filling! Where would frozen egg noodles be located in the grocery store? Thanks! I don’t think I’ve ever seen frozen egg noodles but I would look near the frozen tortellini and meatballs. They are usually in the frozen meals section. I already “like” Gooseberry Patch! Thanks! I have “liked” your page on Facebook. I “liked” Gooseberry Patch long ago..Hope I’ll be the lucky one!! My favorite dish is an easy slow cooker meal in one..I brown pork chops then add them to Golden Mushroom soup..let cook on low for about 4 hours..I sometimes add sauteed peppers and onions on top and about 2 hours in I add potatoes that have been partially nuked. Meat and potatoes all hot with gravy and in one pot!! Add a green salad and you’re set! I already like Gooseberry Patch on their Facebook page. I LOVE their cookbooks!! I too found you through Gooseberry Patch. Liked your site, so I will gladly “like” you!! I usually fall back to my Wild rice & Chicken salad (can easily be a side or main dish). So sign me up for three chances! Hi, I usually bring sour cream enchiladas or pumpkin muffins. I liked “A Recipe A Day” today and was already friends with Gooseberry Patch on Facebook. Depends on the need, if it is a bunch of people such as the local fire department, (we had major flooding here recently and I made a Hamburg BBQ and helped with meal makings) but I like to make Hamburg BBQ, Chicken Broccoli casseroles, Mac and Cheese or meatballs. I like to bring chicken spaghetti and a loaf of garlic bread or salad. My favourite dish to take to someone is hash brown casserole and/or Hawaiian beef casserole. I liked Recipe A Day on Facebook, too. Love Gooseberry Patch! I usually take chicken noodle soup or vegetable/beef soup with homemade bread or biscuits. I like making baked macaroni and cheese to take to a friend..such a comfort food. I like to take chicken spaghetti. So yummy and so simple! I already “liked” Gooseberry Patch on Facebook. I have many of their great cookbook collection! Would love to win this cookbook to add to my ever growing collection of Gooseberry Patch cookbooks! I usually take Chicken Enchiladas to friends in need of a break from cooking! I just “Liked” Recipe a Day on Facebook! I just “Liked” A Recipe A Day on Facebook! Homemade mac & cheese with the recipients favorite meat or fish. When I have a friend who is in need of a meal, I prepare baked ziti or chicken. I’ll bring along a salad and dessert. Than you for the chance to be included in the drawing – I love Gooseberry Patch! I like to take a cassarole in a disposable foil pan – easy to serve and then throw away – no clean up or returning pans. My favorite is lasagna, but also LOVE chicken and noodles! I love Gooseberry Patch Cookbooks. I just got one for my birthday! I am a cookbook Freak…. I usually take my homemade Chicken noodle soup. My favorite dish to take a friend in need is a shepherds pie. I already “like” Gooseberry Patch, have asked their help with accomodating a recipe, and liked a recipe, which I will now do daily. To a friend in need, we raise our own chickens and I usually cook them a chicken dinner using one of our smaller chickens with dressing, veggies, gravy, biscuits and apple crisp. No complaints so far. Sometimes it’s stew and biscuits, but usually apple crisp for dessert. Found your site through Gooseberry Patch on Facebook. I like your site and have liked your facebook page. I am excited to visit around your site. My favorite thing to bring to someone sick or homebound due to illness or surgery is chicken pot pie. Love comfort food! I already “like” Gooseberry Patch on FB. Love there books. Hi Nancy, I am a fan of “Recipe a Day and Gooseberry Patch” on face book. I usually take Lasagna / Salad/ garlic bread. This allows the friend or family in need to have more than one meal or freeze it for later. I like “A Recipe a Day” on Facebook, and already liked Gooseberry Patch on Facebook! Your recipes look so delicious that I am going to have to make this Chicken Tetrazini. I love Gooseberry Patch! I like to take a vegetable casserole or sandwiches for family and friends in need. I also ‘liked’ A Recipe a Day on FB and already ‘liked’ Gooseberry Patch on FB. Thanks for the recipe! The chicken tetrazinni looks wonderful. I already follow Gooseberry Patch on Facebook. I love to take my Sausage and Chicken Gumbo! tuna casserole, Mexican casserole, or lasagna! I love Gooseberry Patch! They are awesome! “Like” Gooseberry Patch on Facebook. Baked Ziti and/or Swedish Nut Cake. New email follower of your blog. i like a recipe a day & gooseberry patch on facebook. not sure what dish i would take. haven’t been faced with that dilemma yet. My favorite dish to bring is Spaghetti. Great as leftovers. And I just “liked” A Recipe A Day on Facebook and I already “liked” a Gooseberry Patch on Facebook..I also have the Gooseberry Patch cookbook “Comfort Foods.” I love it. I like A Recipe a Day on Facebook. I like giving family and friends some pecan pie muffins. Love your blog. Already liked on FB and also follow Gooseberry Patch on FB. I like Recipe a Day on facebook. Lasagna is a good food to take to a friend in need! I like to take Beef and Noodles to friend and family. I just “liked” your “Recipe A Day” facebook page…I had not seen it before. I already “like” Gooseberry Patch. I love your cookbooks… I have a few that are not GOOSEBERRY PATCH, but I also KNOW I have over 50 of various GOOSEBERRY PATCH COOKBOOKS. Your’s are the best… great recipes and I usually have the ingredients around home, so it is a win- win situation. Thanks. I already liked Gooseberry Patch on Facebook. I liked A Recipe A Day on Facebook. I like to take chicken and noodles with hot rolls to friends/family in need. I had already like Gooseberry Patch on facebook and I am new to you, but I liked A Recipe a Day, now, too! Favorite dish would be a casserole. I like to take Chicken and Noodles and hot rolls to friends in need. I liked A Recipe a Day and I already liked Gooseberry on facebook. Thanks for the opportunity! I carry Chicken and Dumplings and Taco Soup to my parents. They love warm one dish meals. I am already a follower of Gooseberry on facebook. I liked receipe of the day on facebook, what I like to take is chicken spaghetti and a oogie cake. Really anything home cooked seems to lift the spirits of a someone not feeling well. I already am a fan of Gooseberry Patch on Facebook. Love looking at the recipes and now that I am retired maybe I will have more time for the kitchen to try new recipes. Everyone loves our macaroni and cheese with swiss cheese in it….I would bring this. I love making soup, because it can always please an audience. It can feed a family, but it can also be given to just one person and feed them for a week. Soups appeal to vegetarians and meat eaters alike – it’s perfect! I’ve already “liked” A Recipe a Day and Gooseberry Patch on facebook! I usually take crockpot Mac & Cheese to neighbors & friends because it is the one that is requested the most. Love to take other things like homemade beef veggie soup or casseroles. Thanks for the chance at an awesome cookbook! Great blog! I like to bring Enchiladas as my ‘take & bake’ to friends/family. I “like” your facebook page & I also “like” Gooseberry’s facebook page. Have a great day! I like a recipe a day & also LIKED facebook on that page. When I have to take something to a family for whatever reason-like to take lasagna with a salad & fresh bread. found you thanks to Gooseberry Patch on FB, Yr chicken recipe looks good AND easy. Would love to win the cookbook! I liked Recipe a Day, also. I like to bring lasagna, because (almost) everyone likes it and it reheats well. I already “liked” Gooseberry on Fb and now I also “like” A Recipe a Day. My favorite recipe to whip up for those in need is sour cream chicken casserole…easy and tasty! I already like Gooseberry Patch on face book. 🙂 Love my cookbooks! I follow a recipe a day on Facebook. My friend just had a baby and I brought her pizza pasta casserole and baked macaroni and cheese. For someone who is sick or just under the weather,my Mom’s chicken vegetable soup can’t be beat! Love Gooseberry Patch and their cookbooks! I liked Recipe A Day on Face book. Just found the site & already i am in love with it! Thanks for the chance on the great cookbook! Breakfast casserole. Mainly because I don’t cook that much, because I work a lot as a graphic designer. I only mention my profession because even though I don’t cook that often, I am sooo in love with Gooseberry Patch. I haven’t bought one of their cookbooks yet, but I love the hand drawn art and their special style! I am new to the site and I love it. For many years I just lived on fast food. But now I really want to cook more for myself and my fiancee. I Liked Goosberry Patch and I Liked a Recipe a Day. I do make my chilli for friends in need. It is great and can be put over rice, noodles, or a hot dog for the little ones in the family. Love this blog!!! Love the recipes and info. Thanks so much! I already follow Gooseberry Patch on FaceBook. I just signed up for A Recipe A Day. I usually take Macaroni and Cheese with Ham. Everybody loves it. I love to share my easy cheesy enchiladas. Just “Liked” you on Facebook… Love your page and your blog! Hello, I am new here. I visited recipe a day, found that I liked it very much, so, happily clicked the “like” button. I agree, Paula Deen’s recipes never seem to provide expected results. I am happy to say that I already “like” gooseberry patch’s FB page, it is how I learned about you. I like to bring a friend a casserole of browned ground beef (or turkey) “mexi-corn”, noodles and olives in a tomato base with cheese on top. I don’t know if it has a “name”, my mom made it and now so do I…I just call it “casserole”…it freezes and reheats well, is filling and nourishing and a great boon especially to new Mommies. Thank you for considering me, but mostly thank you for sharing. I like “A Recipe A Day” on facebook! Neat page! I LIKE you on Facebook. Going to be looking forward to getting these posts! I like Recipe A Day on Facebook! Weeeeeeeeeeee!!! My favorite thing to take to friends and neighbors in need is Cheese Enchiladas, my Mom’s recipe. Love your blog and already “like” ‘A Recipe a Day’ and ‘Gooseberry Patch’ on Facebook. I like gooseberrypatch on facebook! I already like Gooseberry Patch on Facebook! My favorite dish to bring a friend or family member in need would depend on the need. If they were sick, I would bring the old stand-by: Chicken Noodle soup. If there had been a loss, I like to bring a fresh fruit dish, since most people bring heavy desserts. That way they have options. I like to share three-bean chili with cheddar cheese scones with a friend in need! It warms the belly and soothes the soul! I just liked A Recipe A Day on Facebook. Can’t wait to see what u post! I give “Baked Mostaccioli” for those in need. I “liked” A Recipe a Day. I already have been a follower of Gooseberry Patch on Facebook. My favorite thing to take to somebody is anything baked. Usually cupcakes or banana bread. I always like to take a pressure cooker full of garden green beans, potatoes, onions and turkey sausage. We live way out in the country, so fixing this in the pressure cooker allows for time to cool off on the way there, but still be hot enough to enjoy for a pitch in dinner! I like Gooseberry Patch on Facebook, which is how I found you! I like A Recipe A Day on Facebook ! Already like Gooseberry Patch, that is how I found your awesome blog! Hi Nancy, Like so many others, my love of cooking and collecting recipes is truly my passion. If there is a person that needs a little cheering up or I just want to do something special for the family I like to make my version of apple cake. I like to fix Chicken & Noodles for others, especially with homemade noodles. I already like Gooseberry Patch on Facebook!! I love GBP! I would take a friend chicken and rice soup. It’s a recipe that pretty much anyone can eat, even those that are gluten sensitive! Please enter me! I like A Recipe A Day on Facebook…so glad I found your page! Already a Gooseberry Patch fan on Facebook! New fan of A Recipe A Day on Facebook! I already like Gooseberry Patch on FB. I just liked Recipe A Day on FB on have already liked Gooseberry Patch on FB. I like to take baked spaghetti or pizza pasta! I just liked the recipe a day!!!! I like recipe a day on facebook! My favorite dish to bring a friend in need is Lasagna Rolls! Cooking is fun. When I know someone needs a lift, I bring homemade Hamburger Vegetable Soup! Easy to make, you normally have all the ingredients, just a great, warming soup! Lasagna is what I like to take to friend or family. I usually like to bring baked spaghitti and garlic bread. it freezes nice and is such a great comfort food. I like to take a chicken rice casserole to a friend in need. Thanks for chance to win. I like to bring homemade soup or fried chicken to friends in need, comfort foods are the best! My favorite dish to bring to a friend is homemade chicken noodle soup and rolls! I have a great spaghetti pie recipe, actually it is a freezer meal recipe that makes 3 pies. I bring that to friends when they have babies or they are sick. I already like gooseberry patch on facebook and I will like your page as soon as I get done here! I take a dish called Bird’s Nest Pie. Hello, I am new to GooseBerry and would love to get a cookbook! This receipe looks wonderful! I think I will give it a try! TY for posting! I make a great & very easy Hamburger Vegetable Soup. It is warm & can be frozen or reheated. You can add whatever veggies you like. We change it up from time to time but the base is always the same. So quick to make any time with mostly items you have in the pantry! I JUST LOVE THIS BLOG AND THE RECIPES ARE DELICIOUS. THANK YOU FOR YOUR POSTS. For someone in need or suffering a loss or someone who is sick, I like to take them Chicken & Dumplins! Just something wholesome that tends to make you feel better! Sheila, Chicken and Dumplings would be just right for someone who needs comfort. Only problem is, I have never been able to make it to where it tastes worth eating lol. I already “like” A Recipe A Day on FB. Thanks! Love your blog! Good luck! I already “like” Gooseberry Patch on FB. Thanks! I like to take apple/raising bread to friends and neighbors…….warm and comforting. I love bringing lasanga to my family. Love your blog! Baked spaghetti is my “take-a-dish” I “like” you and Gooseberry on FB. Keep those wonderful recipes coming. I enjoy them!!! Mac and cheese. Combining ideas of recipes from restaurants in Williamsburg, VA and Lyme, NH. Cream base includes white wine, several kinds of cheese, garlic and thyme. Cook pasta with garlic cloves and thyme. I have liked both A Recipe of a Day and Gooseberry Patch. I also “Liked” Gooseberry Patch on Facebook!!! I “Liked” Recipe A Day on Facebook! My favorite recipe to bring to a friend in need is Tater Tot casserole also called Easy Beef Casserole. It’s a simple layered casserole I found in Southern Living. Would love to win cookbook! Just discovered your blog through FB Gooseberry Patch. Can’t wait to look over the blog. Happy FAll! Just found your blog thru FB Gooseberry Patch. Would love to win a GP cookbook. I have a very large collection of them. Can’t wait to look through your blog. I usually will bring either baked ziti or comfort meatballs. Both dishes are great for people that also have little ones! I love Gooseberry Patch cookbooks. I just bought my mom one for her b’day! I also liked your blog on FB! Homemade Mac & Cheese.. ooey gooey comfort food made with love! I usually make lasagna. My favorite and usually everyone else’s comfort food. I can make the recipe for a vegetarian, meat eater or, someone who is gluten free. With the change in the weather here in Ohio everyone has the sneezes or the sniffles. What better dish to share then home made chicken noodle soup. It warms the body and soul! I would love to win the recipe book it would be my first gooseberry patch but I am thinking not my last! I love the recipes here and there! I usually bring some taco soup. Its pretty simple to make, filling and delicious, and it reheats very well. I take a chicken and rice casserold and usually a loaf of homemade bread and a jar of homecanned green beans! I love you on facebook. Is there a love button?!? I’m drooling over my keyboard right now. Favorite dish to bring to a friend or neighbor…. casseroles. Who doesn’t love someone else doing the cooking? I usually make my wild mushroom and chicken pot pie! very comforting dish. I also “like” a recipe a day on facebook as well as Gooseberry Patch. A big pot of chili in winter or fried chicken in summer. Morning Nancy! Usually like to take some sort of chicken (most often either a whole herb roasted bird or my oven b-b-q chicken using drumsticks and breasts), mashed potatoes or rice, and a salad. Then I also take a OMAC dish in a disposable foil pan that they can stick in the freezer and have on hand for later when the meals quit coming in. I’ve been a fan of “A Recipe A Day” for some time now…what RZ groupie isn’t 🙂 And though I love Gooseberry Patch, I have never thought to look them up on FB. Going to go do that right now. Have fun with your first giveaway! I liked your page and gooseberry’s! Maybe I will actually win a giveaway for once…Haha. I bring a huge pot of hearty stew with loads of veggies – beef and beans. It’s filling, can be easily reheated and yummy! Morning Nancy! I tend to like to make different meals for people in need (depending on size of family, age of kids etc…). However, one thing I always do is make one meal that they can eat right away and then some sort of OAMC dish to put in the freezer. That way they always have a little something after the meals stop coming. I’m already a fan of “A Recipe A Day” (what RZ groupie isn’t…) and though I too love Gooseberry Patch I never thought to look them up on FB. Going to go like them now. Have fun doing your giveaway! I like to bring lasagna or homemade mac and cheese with a ham. Hi Nancy – I have been your “fan” on FB for a long while now and also Gooseberry. I love your recipes you send to us by email and have used a few and saved many more!! One of my favorite things to bring to a friend who just needs a pick me up is slow cooked roast beef and cheesy potatoes. That way leftovers can be used for another meal or sandwiches. I usually also bring a fruit salad or applesauce and a light dessert or quick bread. I usually bring mac and cheese with canadian bacon or I will make a few little loaves of small meat loaf.